Bernd Pischetsrieder, chairman of BMW since 1993, was replaced Friday after an emergency board meeting. His replacement, Joachim Milberg, at left, former head of engineering and production, is a surprise since industry followers expected Wolfgang Reitzle to be named to the top spot. The reason for Pischetsrieder's ouster is rumored to be his inablity to turn around the Rover group, purchased by BMW in 1998. How this will effect BMW automobiles remains to be seen, however Pischetsrieder is credited with the increased popularity and sales of BMWs world wide. The new M5 debut in Europe at the Paris auto show, and has been shown in the US to BMW CCA members at the M Day event in Spartenburg, South Carolina. Sporting 400 horsepower from its 5 liter engine and a 6 speed transmission the car is the fastest production sedan. BMW's sport utility vehicle, the X5, called a "Sport Activity Vehicle" by BMW, will debut in North America at the North American International Auto Show in Detroit in January. 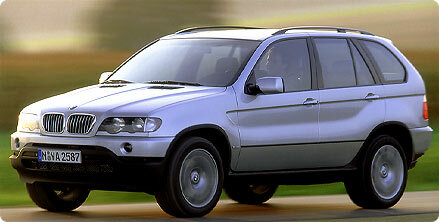 For more information about the X5 see the Rumors page. The slightly restyled 7 Series will offer a sport package on the 740i(L) models, consisting of a shorter final drive ratio, a higher stall speed torque converter and an M sport suspension. The sport package will cost US$2,600. 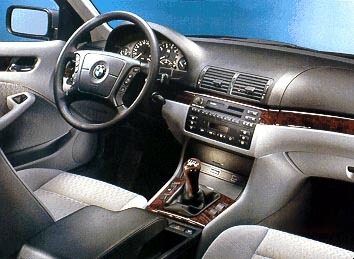 The 740i has a base price of US$62,400 while the 740iL has a base price of US$66,400. Starting next spring, the 740iL and the 750iL can be equipped with a light armor package. The armored vehicles will be produced in house by BMW. Additionally for �99, the Z3 roadster�s entry level 1.9L 4 cylinder engine will be replaced by a 2.5L 6 cylinder engine, with a new designation of Z3 2.3. The new addition will cost US$29,950. According to Michael Erne, the Z3 product manager, "The 1.9 attracted new customers but didn�t have the reach of the 2.3." BMW expects the M Individual program to be available in the US in 1999, offering 12 additional exterior colors and 42 different colors and grades of leather and cloth interiors. Side view of production car. 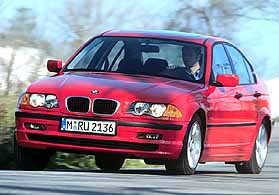 Seen on the AutoBild web site out of Germany, official pictures of the upcoming 3 Series (E46 chassis). The car will be offered in Europe in 318i, 320i, 323i, and 328i engine and trim levels. It is likely that the 320i, 323i, and 328i versions will be released in the US with 150 (4-cylinder), 170, and 193 horsepower, respectively. 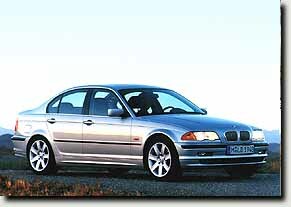 Europe will also receive diesel powered versions, in the form of the 320tdi and, later, the 328tdi. 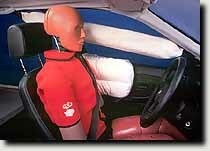 The car will have, standard, side air bags, and BMW's newly developed head restraint system. Interior view showing air bags. BMW is introducing three new M Cars to the US this year, the M3 convertible, the M Roadster, and the M Coupe. Experience driving in the classic GT tradition, but with a heart-stopping twist of power. The dramatic M coupe brings hardtop style to the same platform as the M roadster. And with a 240-horsepower M3 engine under its hood and M-calibrated handling and braking, it will quickly set itself apart from would-be challengers. No other sports car will look like it and we expect that few will be able to match its performance. Specs and features - to follow soon. 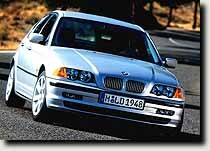 M coupes to be available at authorized BMW Centers Fall '98, in limited quanities. As you may already know, BMW has introduced new 323is and 323i convertible models. With a 2.5 liter 168 horsepower engine, the cars are priced at $28,700 and $34,700, respectively. 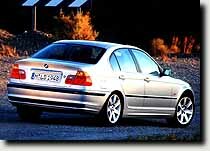 For 1998, these cars will supplant the 318is and 318i convertible models and raise the refinement level of the 3 Series cars. The 318i and 318ti will continue as the baseline 3 Series offerings. Europe, however, has been graced with a 323ti, or Compact, as it is known over there.